I am the second oldest child of 4 so i grew up surrounded by children. In high school I also did a lot of babysitting. In university I helped tutor and mentor underprivledged youth at risk. 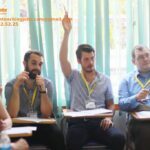 I also spent a month over summer in Vietnam volunteer teaching and coaching in a rural school to help underprivledged classes. After graduation. I spent 13 months teaching English as a foreign language in Seoul, South Korea from 2016-2017. I then moved to Milan, Italy where I spent a year working as an English tutor and nanny. I worked for families to help teach there children English.